ADDICTED TO BEAUTIQUE MEDICAL SPA? 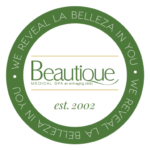 The BeautiPerks program is our loyalty program provided available to all clients of Beautique Medical Spa. You’re automatically enrolled upon your first appointment, and every dollar spent earns a point that gets you closer to your next beauti fix. Once you hit 2,500 BeautiPerks, you’ll receive a $25 BeautiReward Voucher redeemable towards anything at Beautique! 2,500 BeautiPerks = $25 To Spend At Beautique!